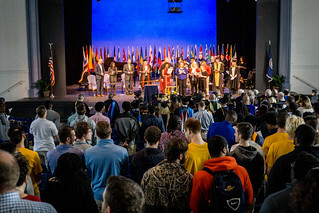 Averett University welcomed students for the spring semester during its annual Founders’ Day celebration on January 12. Founders’ Day is a tradition at Averett, dating back to the university’s creation in 1859. In the beginning of the spring semester, it is a time to gather and remember who we are, based on where we came from as a university. The day recognizes the significance of the founding contributors of the university, not just since 1859 but those people from all years that have made a difference. In the official opening ceremony, held in the Violet T. Frith Fine Arts Center, Dr. Timothy Fulop, vice president for academic affairs and student success, welcomed the students, faculty and staff to the celebration, which was followed by a hymn, “Praise the Source of Faith and Learning” sung by all. 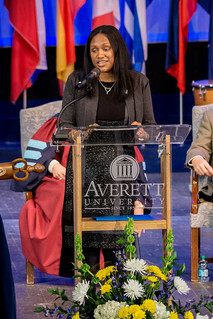 Dr. Tiffany Franks, president of Averett University, introduced Founders’ Day, asking those in the room to take a look at the journey the university has taken. She then recognized those who are alumni and now work for Averett, asking them to stand. “Returning to dedicate their life’s work to Averett is huge. All those who have stayed with us truly understand the traditions and Averett’s mission. They are all devoted to student success,” Dr. Franks said. Dr. Franks told the Averett family to honor the traditions and history but to not live in the past. She said rather, we need to look towards the future like our founders did. “Even though we do not know what the future holds, we need to follow in the footsteps in our founders. The choices we make today can and will affect our future and the future of generations to come,” Dr. Franks said. Buddy Rawley, ’75, vice president for institutional advancement, introduced three alumni speakers. Joe Sutliff ’85 graduated from Averett with a B.A. in church ministries. He is currently the director of economic and governmental affairs with the Roanoke Valley Association of REALTORS, and resides in Vinton, VA.
“Besides a fantastic education Averett provided me with three things. Friends, heck one of them is my spouse. A sense of being, what I wanted my life to be like no matter what I do vocationally. And the ability to learn, grace and love and compassion. This is a place of diversity. I am now more open and accepting of those who are different than me,” Sutliff said. Mrs. Kaylin Sturdifen ’05, ’07 is a two-time alumna of Averett, completing a B.A. in English and a master of education degree. She is currently the vice president of Life Push, LLC, and resides in Burlington, N.C.
Mr. Joey Wilkerson ’07 graduated from Averett with a master of business administration degree. He lives in Raleigh, and serves as the director of development at North Carolina State University. “You are surrounded by experts in your field. Take the time to get to know them, create those relationships with them,” Wilkerson said. Before ending the ceremony with the alma mater and the benediction, student body representative, senior Elizabeth Kueng reminded her fellow students why the Averett family really matters.